A true revolution in digital drum technology, the AH-9S Evolution Meshhead Drum Skin is one of XM Edrum’s most exciting creations to date. There is nothing in the world like it. Now, you can add an electronic drum skin to your normal drum kit. The resulting possibilities are phenomenal. In keeping with XM Edrum philosophy, the Evolution Meshhead Drum Skin feels and plays just like a real acoustic drum: Real look, real touch and real sound. In essence, it can be used as a ‘secret Edrum’, because your normal drum kit will look the same, even when you are playing programmed sounds! Electronic drums usually appeal to people wanting a drum kit to practice on at home, but who wouldn’t consider trading in their acoustic drum kit for live performances. Now, like the famous ‘futuristic’ Japanese drummer Akira Jimbo, you can crossover and mix both Edrum and acoustic drum sounds in a single drum kit. The Yamaha Edrum kits played on by Akira Jimbo do not have the ability to replicate sensitivity levels of drum hits (soft hits to hard hits), or to adjust individual drum tunings. The top of the line XM 9S module has these functions and more. Old style Edrum kits basically only have a volume switch. Why use an Evolution Meshhead Drum Skin? XM’s state of the art Edrum meshhead drum skins offer a wide range of drumming opportunities for beginner, amateur and professional drummers. Most importantly, you can now keep your own acoustic drum kit and play digitally without needing to go out and buy an entire second digital drum kit. Introduce electronic sounds into your music without even looking digital! For example, you could buy a cheap real drum from eBay, and then use it together in conjunction with a high quality Edrumhead skin. The drum shell does not need to be expensive – it just needs to look cool, right? You’ll make your old, sad kit sound like a million dollars, and people listening will be wondering how you did it. If you already have a great sounding acoustic drum kit, you can mix the acoustic skin sound with electronic sounds, even adjusting sensitivity so only hard hits trigger the second digital sound. There are 99 levels of sensitivity on each XM AH-9S drum skin. If you like the idea of programming sounds from a number of different acoustic drum kits, as well as non-percussion based sounds, you can now do both without having to worry about the stigma often associated with digital drum kits. E.g. you can use a bass guitar sample on the bass drum, keeping the acoustic bass drum sound at the same time. The XM Edrum AH-9S Evolution Meshhead Drum Skin comes with all of these parts included. How does the XM Evolution Meshhead Drum Skin work? This Edrum skin is just like a real drumhead, and it’ll only take you around half an hour to put it on. We supply assembly and disassembly videos and images for changing the skin, but it’s very easy. You don’t need to alter your drums in any way – you won’t even need a screwdriver. However, these digital drum skins are as tough as normal drumheads. You can play for up to 3 years on one skin, even if you hit them quite heavily on a regular basis. The Evolution Meshhead Drum Skin is bouncy, fast and very responsive to touch. It mimics a real drum sound, so you can play at home or on stage, using acoustic sounds, programmed digital acoustic, or non-percussion sounds (sampled from Wave files), vary tunings, and play multiple sounds concurrently. Mix and match different drum kit sounds for each drum! Note: Like all Edrums, these Evolution Meshhead Drum Skins are still great for practicing in high-density population housing and other noise restricted locations. All of this is possible because of multiple triggers. The 9S comes with 2 triggers for each skin, except of course the 18”, 20”, or 22” bass drum skins of which only require a single trigger. For the rest of the drums you can set 3 sounds per drum, giving you a ton of options for variation. Other brands only use a single trigger placed at the top of the drumhead, as do our lower level models, but the 9S also uses a second trigger placed on the inside of the drum shell. Having the 9S’s easy-to-use touchscreen interface connected to your Edrum skins gives you so many advantages. 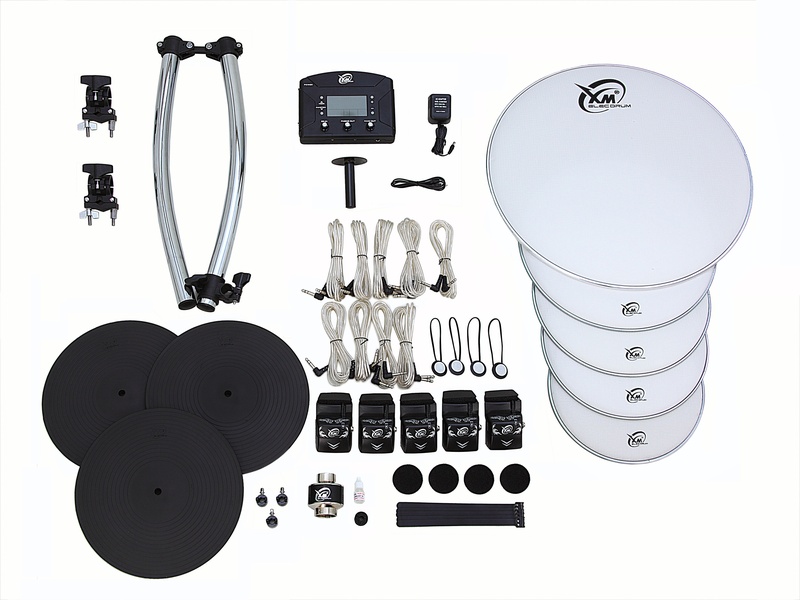 You get 14 inputs for drums or cymbals (it comes with 9, but you can purchase extra if needed); you can adjust drum-hit sensitivity; and you can even play along to MP3 files with CD-in and phone-out jacks. The 9S has a metronome to adjust tempo and beats for practice (1-4 up to 6-4), 30bpm to 250bpm. You can download more drum sounds online via Wave files on your PC. It’s a MIDI interface that can play 6-second loops, and has a USB port. Drum skin sizes come ranging from 10” to 22”, so they will fit any drum you have. This is the same thinking as with real drum kits, and it makes it great for customising your own drum set. Save money and get only the sizes you need. Change programmed sounds on the fly with the intuitive interface, which shows a picture of the drum kit configuration you are using. Simply hit the drum image 3 times to rotate to a new function or sound. What comes with the 9S Evolution Meshhead Drum Skin set? This MIDI trigger drum system has 5 dual triggers – each can make 3 sounds (the bass drum has 1 trigger); 3 cymbals (2 cymbals, 1 Hi-hat); one Module – 3 sounds for each trigger: drumhead, rim shot, rim (it’s back-lit so you can see it easily in a dark club setting); 9 cables – entire set (These are high quality cables, heavily reinforced, and have good reflective aesthetics – so you can still look cool if they are seen; 5 skins – choice of sizes, 8 to choose from, choose any you like (Popular sizes are: 12”, 13”, 14”, 16” and 22”); Protectors – like Velcro, but glued; 9-volt A/C power adaptor (this used to be 6-volt); a module stand (3 screws); Hi-hat controller; Hi-hat controller lubrication oil; Noise reduction cushion; Cymbal stand clamp; and one crossbar (which is needed for good aesthetics – it’s easy to assemble with only 2 clamps). 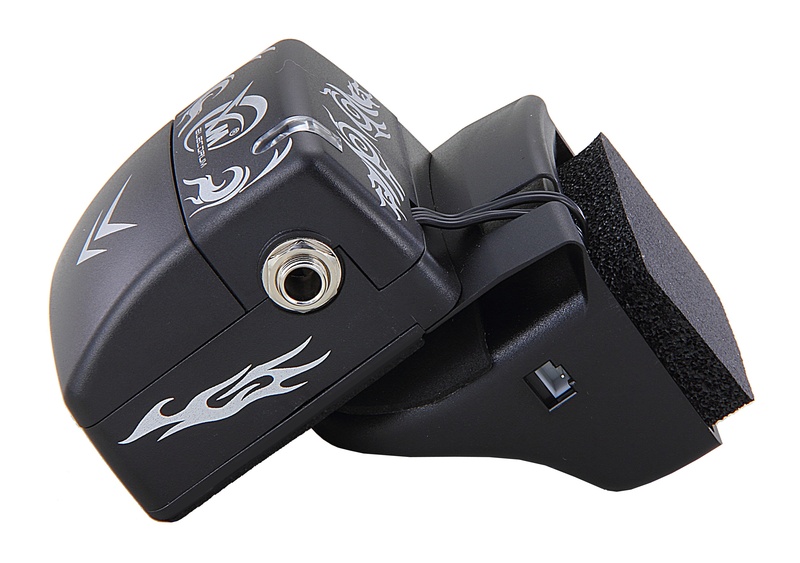 The simple yet durable XM AH Trigger Box for the Evolution Meshhead Drum Skin. The Hi-hat has all of the expected functions, plus mute foot, or mute hand (both), and you can use your heel for a ‘foot splash’ as with Latin and jazz music. These cymbals are very realistic – 4 sounds: choke, surface, bell and edge (edge sound needs a hard strike). Evolve your drum kit to the next level by getting the AH-9S Evolution Meshhead Drum Skin from XM Edrum!